Using pesticides in the garden was once a common practice for getting rid of those pesky pests that ate away at the fruits of our labour, not to mention our literal fruits! However, pesticide use has been waning since the late 1990s, as more information about the potential dangers of using these chemicals began to be disseminated. The good news is, pesticide-free gardens are a budding new trend. More and more gardeners today want to plant edibles that don’t contain any trace of chemicals, and others just prefer to keep flower beds naturally healthy. And there is a plethora of ways to grow a healthy and vibrant garden and keep garden pests at bay, organically. Start with a good foundation: the soil. Ensure that the soil is not too sandy or has high levels of clay. Boost your soil’s nutrients with compost each spring, and protect your plants with organic mulch seasonally. Healthy soil will grow healthy plants. Consider the climate and environmental conditions. Stick to plants that are suited to your local climate, plant a diverse crop, and most importantly, rotate the crops. Keeping the same type of plant in the same spot for several years encourages nuisance bugs to take hold. Practice due diligence with garden maintenance. Inspect your garden regularly for early detection of pests. Look for wilting plants, discolored leaves, and other damage, and quickly remove diseased plants to stem the spread. Water well and deeply at least once a week. Use homemade, organic anti-pest remedies. It’s easy to prepare your own organic sprays. For instance, a mixture of dish soap, cooking oil and water is a good spray for spider mites and whiteflies; red pepper powder, dish soap and water will keep leafhoppers, spittlebugs and beetles away; and garlic, oil and water will chase away mealy bugs, mice and sucking insects, while baby shampoo mixed with water works for any common garden pests. And as counterintuitive as it may sound, offer your annoying, uninvited garden guests some coffee! Coffee grounds not only add nitrogen to the soil, but creatures like slugs and cats hate it and will be reluctant to come near. Slugs and snails also hate copper–try using copper mesh barriers or just a piece of copper strategically placed in the soil. Some plants are more resistant to pests because of their taste, smell or hard to chew fibers, so consider researching what these plants are and limit your plantings to these, or plant them strategically to function as deterrent/repellant plants. For instance, plant tomato plants with oregano and basil together. Not only does this make for a good salad, but the herbs are strongly-scented and will protect your tomato plants from pests. There’s no need to resort to pesticides when it comes to keeping creepy crawlers off your plants. 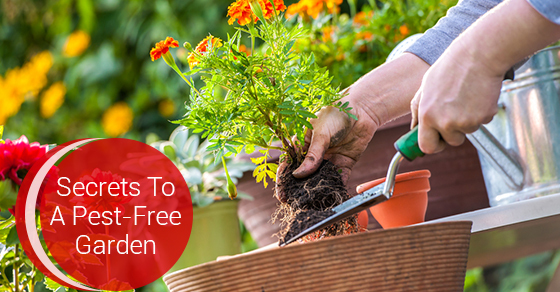 Many chemical-free options are available to you, and won’t even require much added effort. It’s simply a matter of changing your habits and investing your efforts in new ways.